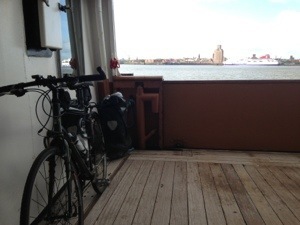 I began the day by taking the ferry across the Mersey to Birkenhead. Not only is it an iconic journey, but it was the only way of getting over the other side without a long cycle around (bikes not being allowed in the tunnels). It was a reasonably sunny morning, and I enjoyed my ride along the ‘windy Wirral’, which in stark contrast to the rest of this trip wasn’t very windy at all. In fact the further I cut inland the less windy it became, and long may that continue. I passed first through Chester, and then hopped over the border into Wales passing through Wrexham (where it started raining) and then back out into England at Oswestry. Final destination for today was Shrewsbury where I checked into a room above a pub. It appears to have everything I require for the evening. A relatively short day after the first leg, and an earlier finish allowing me some extra time to unwind and catch up on correspondence.